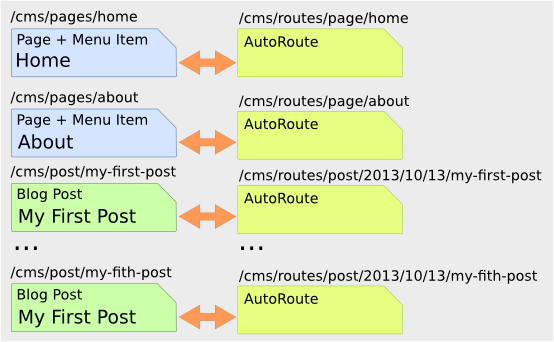 The routes (URIs) to your content will be automatically created and updated using the RoutingAutoBundle. This bundle uses a configuration language to specify automatic creation of routes, which can be a bit hard to grasp the first time you see it. For a full explanation refer to the RoutingAutoBundle. Ensure that you installed the RoutingAutoBundle package as detailed in the Install Additional Bundles section. The symfony-cmf/routing-bundle package is installed automatically as symfony-cmf/routing-auto-bundle depends on it. The RoutingAutoBundle uses the CMF RoutingBundle which enables routes to be provided from a database (in addition to being provided from the routing configuration files as in core Symfony). Configure the dynamic router which you have added to the router chain. You specify that it should use the PHPCR backend and that the root route can be found at /cms/routes. The above configures the RoutingAutoBundle to work with PHPCR-ODM. RoutingAutoBundle mapping bundles are registered automatically when they are named as above, you may alternatively explicitly declare from where the mappings should be loaded, see the RoutingAutoBundle documentation for more information. This will configure the routing auto system to automatically create and update route documents for both the Page and Post documents. Token providers provide values which will be substituted into the URI. Here you use two different providers - content_datetime and content_method. Both will return dynamic values from the subject object itself. The routes have been automatically created!